Take your traditional crepe cake and turn it on its side! 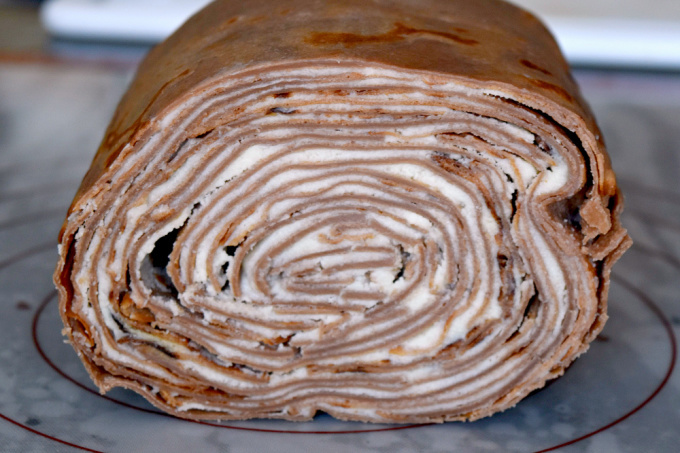 Chocolate Crepe Cake Roll is a fun and different twist on both a cake roll and a crepe cake. When I found out that Swiss Diamond had signed up as a sponsor for #SpringSweetsWeek I was ecstatic. Their products are the best nonstick products I have ever tried. And trust me when I say I’ve tried almost every non-stick product there is. I signed up to receive their 9.5 inch non-stick fry pan because I knew it would be the perfect size for crepes. And I’ve been wanting to make crepes for a while now. However I didn’t have the correct pan to make crepes. And I flat-out refuse to get a crepe pan. We have enough pots and pans as it is without another specialty pan like a crepe pan. Now I do have their aebleskiver pan. But that’s not a single-use pan. I can use that to make lots of things. I haven’t done that yet. Now I know I wanted to make crepes but I wasn’t exactly sure what kind of wanted to make. Did I want to make regular crepes? Or did I want to make chocolate crepes? Or fill some with chocolate mousse? So, of course, I headed to Pinterest and started searching for crepes. And then I remembered in the deep dark recesses of my “to make” list that I wanted to make a crepe cake. So I started searching for crepe cakes. And there were many and they all look so delicious. Part of me also wanted to make a cake roll. In fact I put a cake roll on the sign up sheet for this event. But when I saw what the sponsors were offering us I changed my mind. By the way I cake roll is also on my “to make” list. No, I’ve never made one. Why not try to make a rolled crepe cake? I mean all the crepe cake recipes I had seen on Pinterest, or any other website mind you, are all stacked. In some fashion they’re stacked one on top of each other. And they look really pretty. There was even one that stacked them and then turned it sideways somehow. Don’t quote me on that unless you want me to find the pin. But there weren’t any recipes for a crepe cake roll. So that’s what I decided to make! Since this is the first chocolate crepe cake roll I have made I think it looks pretty awesome. Yes, I know there are some gaps. And I’m sure there’s something to the technique that I could improve on the next time I make one. And yes at this point I will make another one because it looks pretty freaking cool. This chocolate crepe cake roll tried almost every ounce of my patience. I tried to roll it tighter. Really, I did. It made such a mess . I had the mascarpone whipped cream everywhere. It did wind up in my hair at one point. And this was one of those recipes where I realized I should have some rubber gloves. Because I make a mess sometimes. The thing that frustrated me is that I wanted the chocolate crepe cake roll to not have gaps. To say I’m a perfectionist sometimes is a bit of an understatement. Especially when I have an image in my head of what a concept will look like. The image in my head did not include gaps. But hey, like I said, this is my first attempt. And I still think it looks freaking cool. The easy part about this whole recipe is making the crepes. Okay now I see some of you shaking your heads in disbelief. Trust me when I say anyone can make crepes and they don’t need a crepe pan. They need a glorious Swiss Diamond 9.5 inch fry pan. The crepes cooked up quickly and they were easy to slip off the pan. They didn’t stick it all. These crepes and this pan were magical together. I don’t think I can give enough credit to how non-stick Swiss Diamond pans are. Why diamonds? Because they’re naturally non-stick. Duh! They’re SUPER durable! And, news flash, they conduct heat better than metal. That last part I didn’t know so I thought I’d share it with you. All this means your food just slides right off. I made a barbecue sauce reduction in my pan. It was thick, rich, and I would have soaked any other pan for a long time to get it clean. Not this pan. That stuff just wiped right off with a paper towel. Like all those hilarious info-mercials, but this time it was legit real life true. Because *I* did it for reals. I made the crepes ahead of time. I kept them in a zip-top bag in the refrigerator. I wanted to make sure that the edges did not dry out. So, as they were cooking, I kept a moist paper towel on top so the edges would not get crusty. They started to, initially. That’s when I realized I needed to keep them moist sort of like you do with phyllo dough. You could make the crepes and the mascarpone whipped cream ahead of time and then assemble when you’re ready to serve. Or assemble the day you’re ready to serve. I toyed with idea of coating the outside with a chocolate ganache. But I opted for simple powdered sugar. Feel free to use the ganache idea. It would be decadent. 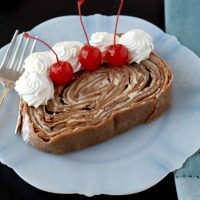 I did a simple garnish on this chocolate crepe cake roll with some whipped cream and cherries. I wanted the flavors of the chocolate crepes and the mascarpone whipped cream to come through. So I didn’t top it with anything except a little whipped cream and cherries. Because I think every dessert should have whipped cream and cherries on it. Now without a crepe pan (and that little wooden stick that pushes the batter around in a circle) I have some words of wisdom. It’s all about the swirl of the pan. I poured my batter in the back of the pan and slowly tilted it in a counterclockwise motion. This worked best for me. If I had any gaps I could easily fill those in with little dots of batter. But for the most part it’s all in the swirl of the pan. It’s also in the thickness or I should say thinness of the batter. The first few crepes were thick and uneven because the batter was too thick. I corrected that in the second batch that I made making sure that they were thin enough. The recipe listed should be thing enough to swirl the batter and make a pretty crepe. Yes you need two batches so doubled the recipe! I finished making the first batch of crepes and realized there weren’t enough of them. Which is disappointing because I had already been standing there for probably over an hour making crepes. For those that don’t know I have osteoarthritis in both my kneecaps. So standing for long periods of time is never on my list of things to do. But what’s a food blogger going to do? Well, they’re going to make a second batch of crepes and stand in front of the stove some more making more crepes. You will probably run out of mascarpone whipped cream before you run out of crepes. And that’s fine. That means you have extra crepes to eat. That’s never a bad thing. Of course there is the quality control check crepe or two that you eat when you start. Who’s with me on this one? I do the same thing with pancakes and waffles. You sacrifice the first one and if it doesn’t taste right you adjust the batter or dough and then you test the second one. “And how does this chocolate crepe cake roll taste?” you ask? It’s sweet without being too sweet. The crepes are chocolaty but not overly so. The mascarpone whipped cream is light enough but you can still taste the flavor and texture of the mascarpone. This chocolate crepe cake roll is perfectly light. It’s light enough to serve at any meal no matter how light or how heavy. I imagine this after a delicious garlicky leg of lamb or brown sugar glazed ham. Yet, it can also be comfortable sitting beside a light spring salad with some grilled asparagus and shrimp. Or maybe a niçoise style salad. I don’t think there is a spring meal where this crepe cake would be out of place. And I don’t think there is a kitchen where this 9.5 inch nonstick fry pan from Swiss Diamond will be out of place. At this point, this fry pan will more than likely replace our current scramble pan. So for those that don’t know you can read about S’s Breakfast Scramble here. But it’s basically some meat, some vegetables, a little jalapeno for kick, and some eggs. It is our go to breakfast when we are both home and don’t have plans for the day. It definitely requires an egg-cellent non-stick pan. Sorry. I couldn’t resist the pun. So you get an idea of how wide this is, the plate it’s on is an old salad plate that’s about 8 inches wide. It’s about as round and wide as a 28 ounce can of crushed tomatoes? All those crepes are thin so it’s not very wide. And that slice is about 1 1/2 inches thick. I think that’s plenty for a serving, don’t you think? Now, this crepe recipe is delicious just on it’s own. If you want to make crepes, then cut the recipe in half and you’ll have about 15 or 20 crepes. They can easily be stored in the refrigerator in a air tight zip top bag until you’re ready to eat them. Make sure you place either parchment or a food grade paper towel (one without color or dye) between each crepe. To reheat them, simply place a stack of four on a microwave safe plate. Top them with a damp towel and heat for 1 1/2 minutes at 50% power. OR you could heat a few on high for about 15 seconds or so. Of course, you could heat them in a skillet or in the oven. If you’re doing those methods you might want to generously coat them in butter to keep them from drying out. But you don’t want to reheat these crepes in the chocolate crepe cake roll. You want to serve these chilled or at room temperature. Make sure to store any leftovers in an airtight container or wrapped in plastic wrap to keep the crepes from drying out. It will store for up to a week in the refrigerator. I hope you read all about the amazing Swiss Diamond technology. Follow them on Facebook, Twitter, Instagram, and Pinterest to stay up to date on new products and recipe ideas! Be sure to enter the giveaway just past the list of participating bloggers for today. If you want to read about the giveaway details, head over to my PB&J PEEPSomars. All the details of the prize packages are listed there. Beat the mascarpone, whipping cream, and vanilla extract until smooth and creamy. Add the powdered sugar 1/2 cup at a time until it begins to thicken yet still spreadable. It will be slightly heavier than a buttercream. Combine the eggs with the next five ingredients (2 tablespoons melted butter through cold milk) in a blender and process until smooth. Heat a 9.5 inch nonstick fry pan on medium heat. Brush with the remaining melted butter. Pour 1/3 cup of the crepe batter into the pan and slowly rotate the pan in a counter clockwise motion allowing the batter to slowly fill the pan. Fill any gaps with additional drops of batter. Cook 2 to 3 minutes or until slightly browned around the edges. Carefully flip the crepe over and cook an additional 1 to 2 minutes or until slightly browned on the other side. Remove from the pan and keep moist with a damp paper towel on top. Repeat with the remaining batter and butter until all the crepes have been made. Spread enough filling to just cover one crepe. Top with another crepe and cover with just enough filling to cover. Place the edge of the next crepe in the center of the first two stacked crepes and spread with enough filling just to cover. Place another crepe on top and cover enough filling to cover the crepe. Continue placing and topping crepes with filling until you run out of room on your work surface. Carefully begin rolling the stack of crepes, making sure to press them together as much as you can. You can then shift the crepe cake roll down and continue topping and stacking crepes until you either tired or have used as many crepes as you want. Place two pieces of plastic wrap on your work surface, overlapping. Carefully roll the crepe cake roll in the plastic wrap and twist the ends to tighten the cake roll. Refrigerate until you’re ready to slice and serve. Slice the rough edges off of each end with a serrated knife. Slice the chocolate crepe cake roll into 6 to 8 slices. Top with whipped cream, sprinkle with powdered sugar, or drizzle with sauce (chocolate, raspberry, strawberry, coffee, etc.) and serve. If you just want to make the crepes, but the batter in half. Thank you #SpringSweetsWeek Sponsors: Dixie Crystals, Swiss Diamond, Nancy’s Yogurt, Barlean’s, Sprinkle Pop, PEEPS, Melissa’s Produce, and Adams Extracts for providing the prizes free of charge. These companies also provided the bloggers with samples and product to use for #SpringSweetsWeek recipes. All opinions are my own. The #SpringSweetsWeek giveaway is open to residents of the United States who are 18 years of age or older. All entries for the winner will be checked and verified. By entering you give the right to use your name and likeness. The number of entries received determines the odds of winning. Eight (8) winners will be selected. The prize packages will be sent directly from the giveaway sponsors. The #SpringSweetsWeek Bloggers are not responsible for the fulfillment or delivery of the prize packages. Bloggers hosting this giveaway and their immediate family members in their household cannot enter or win the giveaway. No purchase necessary. Void where prohibited by law. This promotion is in no way sponsored, endorsed or administered by, or associated with Facebook, Instagram, Pinterest, Twitter or any other social channel mentioned in the #SpringSweetsWeek posts or entry. I love the Swiss Diamond products also! I have never had a pan that cleaned up so easily and cooked so evenly! Your crepe cake roll is perfection. It’s beautiful, and I would love to just eat a piece right off the page! Right?? Their pans are so easy to clean up. Making these crepes just slide right out of the pan. You don’t need a crepe pan! Just a Swiss Diamond pan! Love that you decided to do a crepe cake roll! It’s gorgeous, and I bet it is delicious! Thank you! It was pretty darned delicious. I have seen these but haven’t tackled one. Cannot wait to try it now! I hope you do! They’re rewarding. This is such an amazing recipe! I love that you brainstormed and where so creative with your dessert. I have not attempted crepes before, but you story of the process making this makes me want to give it a try! They’re not as difficult as everyone says. Granted they won’t look textbook, but they’ll be pretty darned delicious. This looks amazing! I like your idea of keeping them light by just using powdered sugar to top it. This dessert would definitely impress dinner guest. I’ve always wanted to make crepes and I’ve always wanted to make a cake roll! So I was meant to make this luscious dessert. Looks fabulous! YAY! I hope you try to make it. It was so much fun. Christie, you are a genius! What a fun idea! And I love the filling to crepe ratio. I really want to try this! Awwww, shucks. Thanks, Carlee! I hope you do try it. It was fun to make and so delicious. This is such a fun dessert! I can’t wait to try it for myself. I love my Swiss Diamond pan too! Your crepe cake is gorgeous and truly I didn’t notice any gaps! You’re so sweet, Karen! Their pans are just so awesome, aren’t they? This is such a creative idea! I’ve never tried making crepes or a cake roll. This version sounds delicious! So many fantastic layers of flavor. It is so fun to look at. Very creative! The roll does look challenging but the results are fantastic.